I recently had some comic money come in, and what do I do with it? Spend it on comic-related merchandise. I'm a hopeless consumer. Perhaps such consumerism can be forgiven, though, when I'm spending some cash on original Fantastic Four art - and not just any, but a page from the great John Buscema...inked by his younger brother, Sal! After Jack Kirby left the book, John Buscema took over and put his own stamp on the characters. John is probably, in fact, the most classic FF artist after Kirby, so I'm of course ecstatic to add some of his original work to my collection. The Thing only appears in one panel on this page, and he's reading a book titled "How to Pick Up Girls". The book is circled in blue pencil with a note about the title written in the margins. I'd have to dig out this issue to be sure, but I'm assuming that they changed the title for publication. Mr. 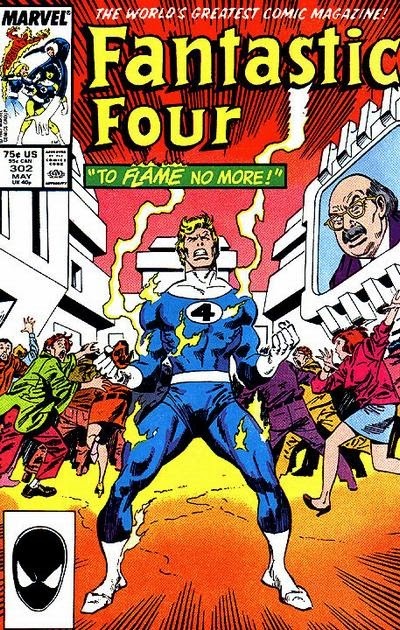 Fantastic and Franklin Richards are the most prominently featured characters on the page...Franklin going through his "Tattletale" stage with the Power Pack around this time. Franklin is a tough character to write, as he's often too powerful and thus no one can figure out what to do with him. But it's nice when the creators try to work him in somehow. The back of the page holds two markings, the first of which reads "hold for John Leight". A quick Google search doesn't bring up any information on Mr. Leight, so I can't confirm that he had anything to do with Marvel or the book. It might be the name of the original owner of the page. It might be the name of someone in production. Perhaps we'll never know. Also written on back are the names of the two contributing artists - John and Sal Buscema. If I'm not mistaken, it looks like the Buscema handwriting, so perhaps this is as close as I'll get to an autograph from John, who passed away several years ago. I recently purchased an art book to hold all of my original art. This page, by virtue of being the oldest and most valuable (and perhaps coolest) page in the collection, obviously gets page one. And not to relegate this to a footnote, because it's very cool in its own right, but since we're talking about original art, here's some new production art that I purchased a little while ago. These two pages are color guides from Fantastic Four #194. 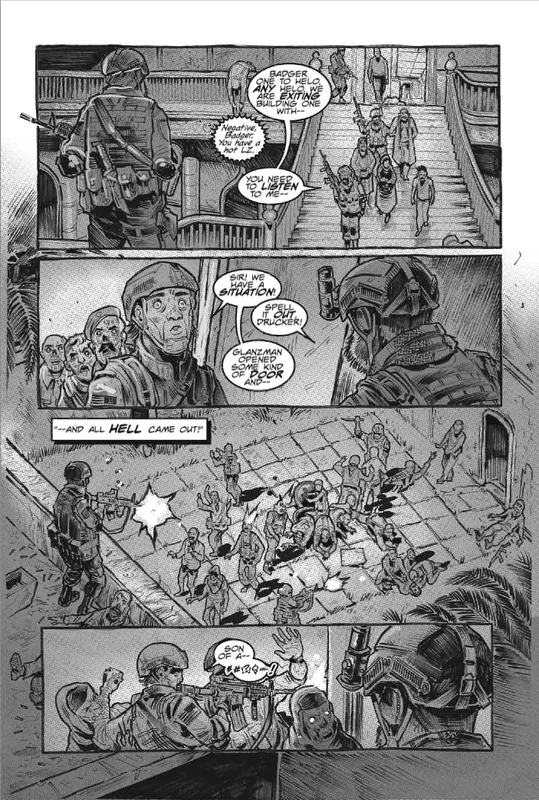 Color guides are reproductions of the original line work that are sent to the colorist, in this case George Roussos. He uses them as a preliminary guide to figure out what colors to use on the real thing...that's why they have markings and writing all over 'em. I think they're a swell look into how comics were made before the proliferation of computers. And this one has some great shots of the Thing and Alicia. Free Comic Book Day is creeping up on us once again, and the FCBD website has recently been updated with previews of all the participating books. I've got two books that I'm involved with this year, which is, of course, very exciting. I hope that everyone will head out to a shop on May 3rd and pick up some comics. Here's a mild shock to anyone who follows my work: I wasn't fired after the 2013 Free Comic Book Day issue of the Tick. In fact, I've written this year's issue as well, and I'm very happy to see it take shape. 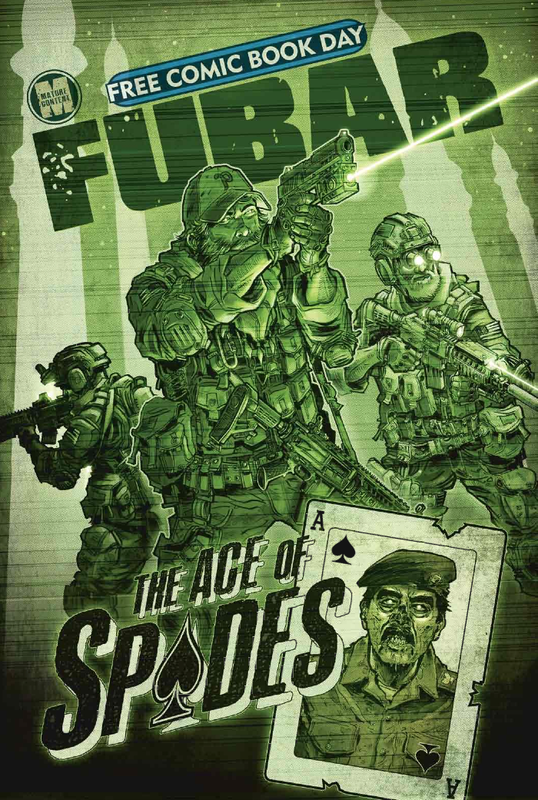 Both this book and the FUBAR issue went out to the printer earlier today, which means that it would now take a lot of effort and money to keep these books from hitting the shelves. The website has yet to put up the solicitation info for the issue. I...I think I can post it here? Right? Yes. 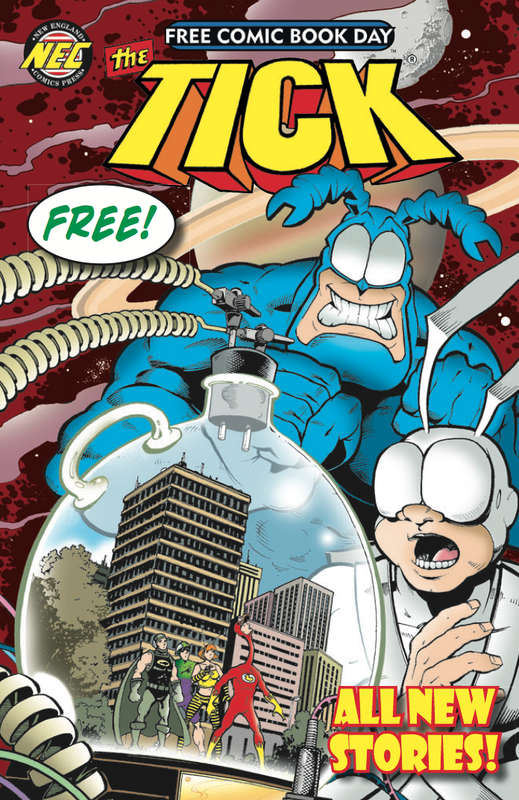 THE TICK returns for FCBD 2014 with a BRAND NEW, FULL COLOR, 32-page comic book sure to entertain fans both existing and new, young and old! In “The Bigger Dig”, The Tick and Arthur face off against the Hoarder, an alien menace who does the unthinkable by stealing The City and all The Tick has sworn to protect! Plus all new backup features! An exciting introduction for new fans and more fun than you could shake a spoon at! If I get yelled at for this, I'll take it down. But damn it, I wrote the thing so let it rip. Fun fact: after we submitted this book to the folks at FCBD, they made us take out all of the swear words. I think that if we reprint this story in the future, we'll put them all back in, and toss in a few more for good measure. Well, hello there. It's been a while but it's time to wind The Yeti Speaks! blog back up with a heaping helping of RANDOM NOTES! In all caps. Let's get started! - I got a nice Christmas card from friend of the blog and one of my favorite artists, Karin Rindevall! The card contained a nice greeting from Teddy and the Yeti. Thank, Karin! - I backed the Kickstarter Campaign for Chipolo...which is basically a tag that links to your phone. If you lose stuff, and it's within a certain range, you can find tagged items by looking for them on your mobile device. I had the opportunity to label the different tags...and I went the obvious route. - I took another trip to Pittsburgh's Toonseum recently and had a nice time. Here are a few pictures from the jaunt! I might have shown this picture before (from my last trip), but I love that Mark Schultz dinosaur with the Pirate hat. Classy. A fun surprise was seeing a page from one of my favorite issues of "What If...?" on display. Despite this page being filled with Captain America, it was a Fantastic Four-centric issue. The angry cap in the last panel really spooked me as a kid. If only I had animation and comic art to possibly contribute to a future Toonseum gallery...such as...*cough*...this newly framed animation cel of the Thing from the 1960s FF cartoon! The Thing artwork isn't the only item I had framed. I also got my ticket sheet from the 2006 MLB All Star Game under glass. It's been a long time coming and I think it looks really nice. I had to buy partial season tickets for two years just to get the opportunity to buy All Star Game tickets. It was a fun time, though, for sure. - I got a few items of original art in the mail. The first is a series of rough sketches from Pittsburgh's own Tom Scioli! The image on the right is a Brian Hitch-inspired team shot of the Fantastic Four. The image on the left, I assume, is a goof, but still pretty cool. There were three more equally cool FF images included in this art buy. - I recently renewed my Hero Initiative membership for 2014. Included in my "thank you" package was an original sketch card - and just my luck, it was the Thing by Marvel Two-in-One artist Alan Kupperberg! What a find. 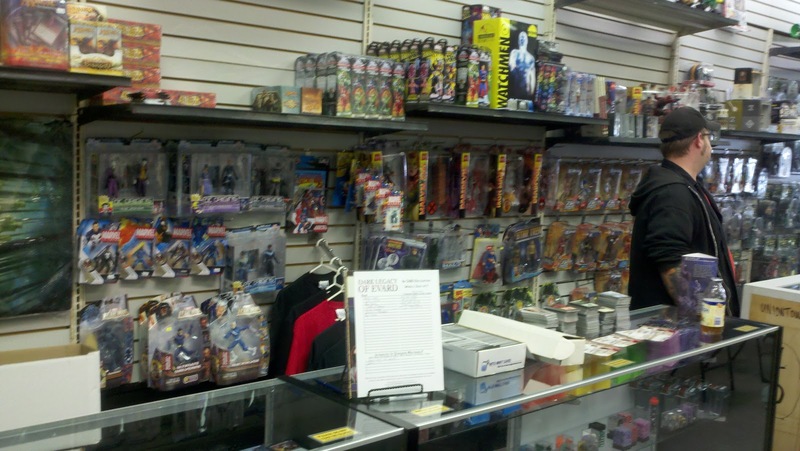 - A few weeks ago, I posted about the closing of California, PA-area comic shop Evil Genius. Since the store was closing, I had to haul away my Ms. Pac Man arcade cabinet, but lucky for me, I didn't have to toss it in the river. 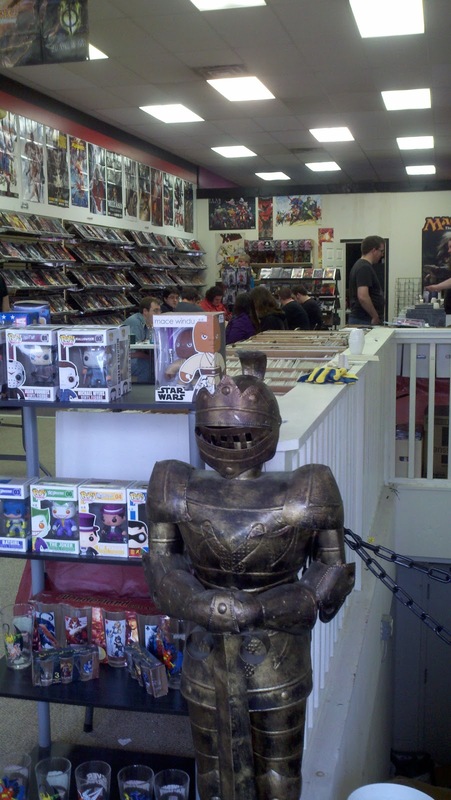 The game is now sitting comfortably in McMurray at Pittsburgh Comics! It was a trial, of course, getting it there (just because the game is not particularly light), but I hope to house it there for years to come. If you visit Pittsburgh Comics, be sure to say hello. To the video game cabinet. - As I was taking the game from Evil Genius, I made one last find and picked up this early '90s-era Marvel comic box. On the very top is a nice image of the Fantastic Four. The box itself has certainly seen some use, but I managed to reshape it fairly well once I got it home, and now it holds all of my comic convention programs and related material. Oh, and here's a picture of my cat sitting in it. - I got this Avengers-themed card for Valentine's Day, which includes all of the movie Avengers...and the Falcon. The message is interesting..."Hope your day is a HIT!" Nothing says "I love you" better than a metaphor for being punched. 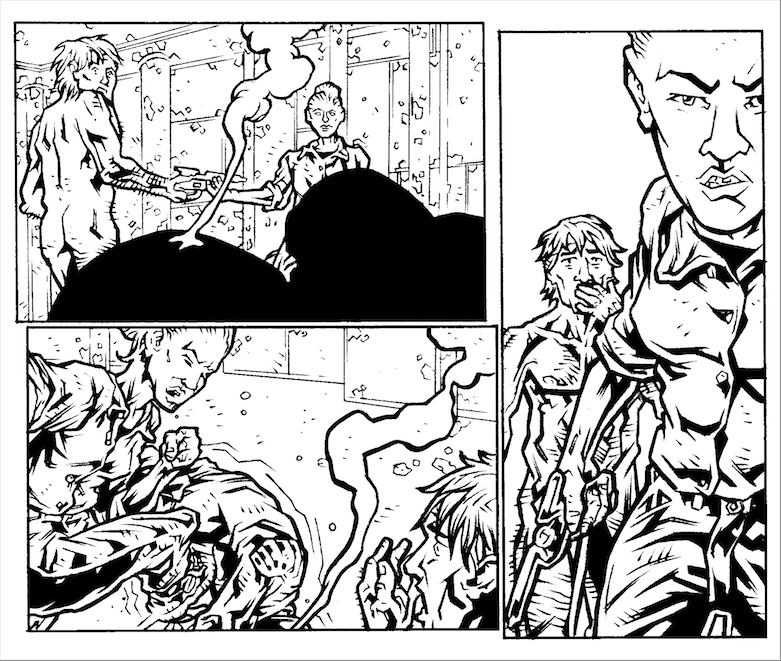 - In case anyone was wondering if I still make comics, here's a panel from the upcoming "Naked Man at the Edge of Time" one-shot. Pencils by Kurt Belcher, inks by Alan Gallo. I'm still considering whether or not this will be colored or just grayscaled. 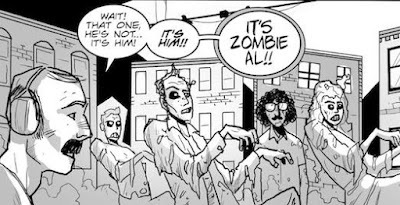 - Keen readers of the recent Thunderbolts #20.NOW (what a weird numbering system) will notice this veiled "Weird Al" Yankovic reference. I wonder what the third song is. - Hey, let's list some links to cool comic book-related websites. The first is for the Longbox Graveyard, which took the time to review and rank every single issue of Marvel Two-in-One, which is no easy feat. 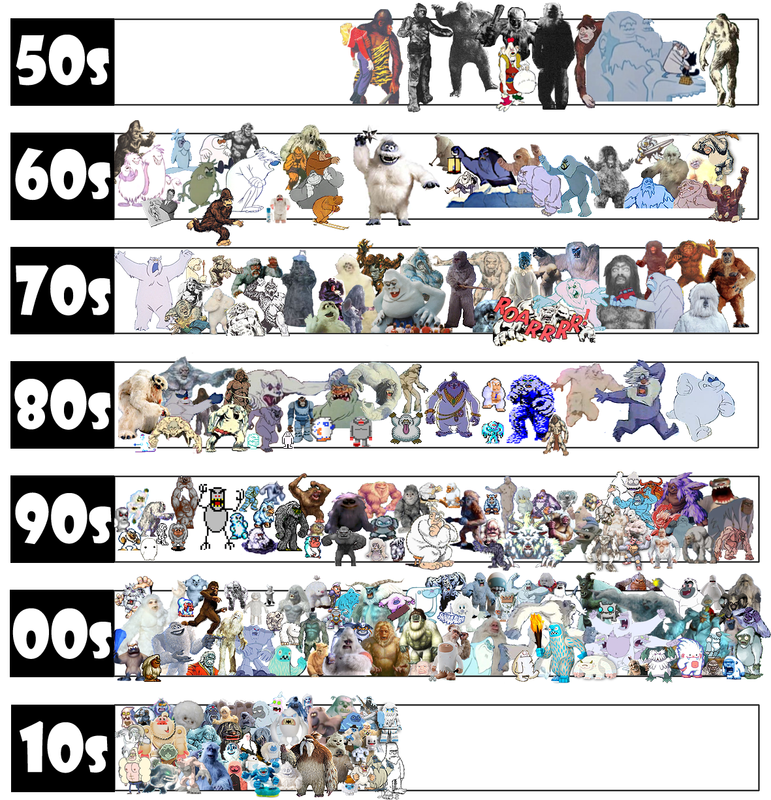 If you look at the very end of the "00s" line, you'll see the Teddy and the Yeti version of the Yeti. 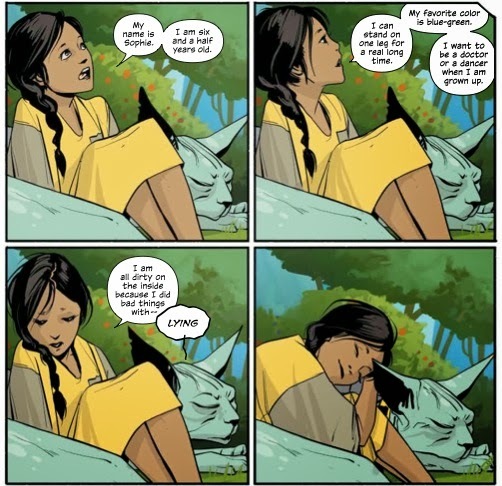 Our last link goes to Multiversity Comics, for writing a very interesting and thought-provoking article titled "Comics and the Diminishing Role of Artists in a Visual Medium", linked here without comment. - One of the many commercials to air during the blowout that was Super Bowl XLVIII was a trailer for the new Transformers movie. Transformers 2 was so bad that I've given up on watching any further installments in the series, but the trailer was interesting in that it included mechanical dinosaur Transformers. This is probably just an adaptation of the G1 dinobots, but wouldn't it be cool if it was instead a reference to Beast Wars? Yes, it would be cool. Very cool. - Here's an image that has been sitting on my desktop for far too long. 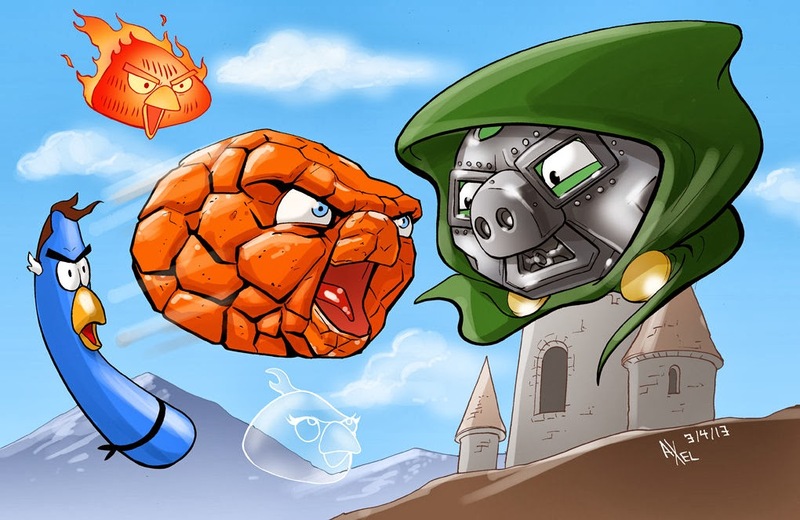 It's the Fantastic Four as Angry Birds. Great. - Your friend (and mine), Larry, went to the Royal Rumble a few weeks ago...and sat next to Ben Roethlisberger of your team (and mine), the Pittsburgh Steelers. Here's video evidence. - Speaking of Larry, there's some new content on the Franks and Beans website. 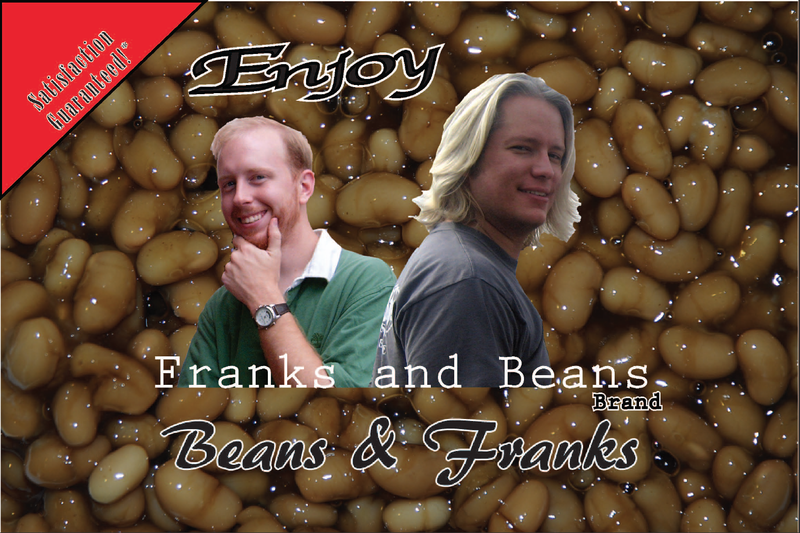 You should check it out, because...it's Franks and Beans, guys. That should be enough of a reason. 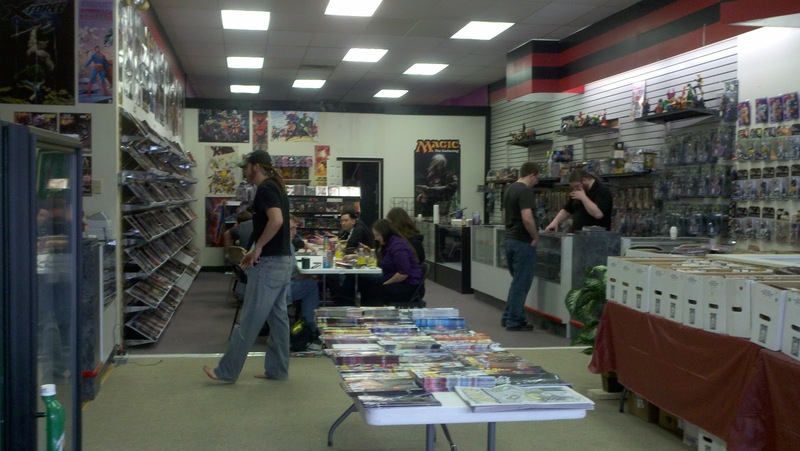 Evil Genius Cards and Comics in California, PA, has closed up shop. This is a shame because the store offered friendly service in a convenient location, which for a comic shop is often hard to find. I found out about this last week and the dismantling has already begun. Owning a comic shop is, and has always been, a risky proposition, but it's still too bad that this one had to go out of business. The guys who owned the shop were good natured and they were supportive of my comics work from the beginning. If there's any good news to take out of this situation, it's that I talked to one of the owners and he said that the decision to close wasn't purely a financial one; rather, he just needed to take a break from the daily grind. There's been talk of relocating and rebranding the store at some point in the fall. We'll see what happens, but I hope the store reopens in some form before too long. This, of course, means that my Ms. Pac Man machine is also on its way out - but don't worry, I'm not wheeling it down and throwing it into the Monongahela River. I'm pretty sure that I've been able to place it at another familiar location, though I'll spill that news once it's finalized. Oh, and the neon "Inky" display will be coming with me, too. As the shop was closing and a lot of the hardware was being taken away, I made one last purchase from the store, and it was a doozy. This baseball came in to the store last spring or summer, and I've looked at it lustily every time I've seen it since. Since the store was in something of an "everything must go" phase, I inquired about the ball and made off with an absolute steal of a deal (note: I did not actually steal it). ...Roberto Clemente. HOLY CRAP! Roberto Clemente! One of, if not the, greatest Pirate to ever play the game, and a cornerstone of MLB lore. But Clemente isn't the only signature on the ball. It's also got signatures from other stars and Hall of Famers such as Willie Stargell (the Pirates all time home run leader), Bill Mazeroski (who won the 1960 World Series in the 9th inning of game seven), Steve Blass (who was the winning pitcher of the deciding game of the 1971 World Series), Danny Murtaugh (manager of the 1960 World Series team), Dock Ellis (who supposedly threw a no-hitter while on LSD), Manny Sanguillen, Nellie Briles, general manager Joe L. Brown and a host of others. What a treasure this is. Thanks for the ball, Evil Genius, and for all of the memories.